What can I say about Gus? He’s an absolute goofball who sometimes makes silly decisions. Today, he made one of those decisions. As I have said in the past, Gus likes to jump to the top of the fridge. He doesn’t do it all the time. Just occasionally. 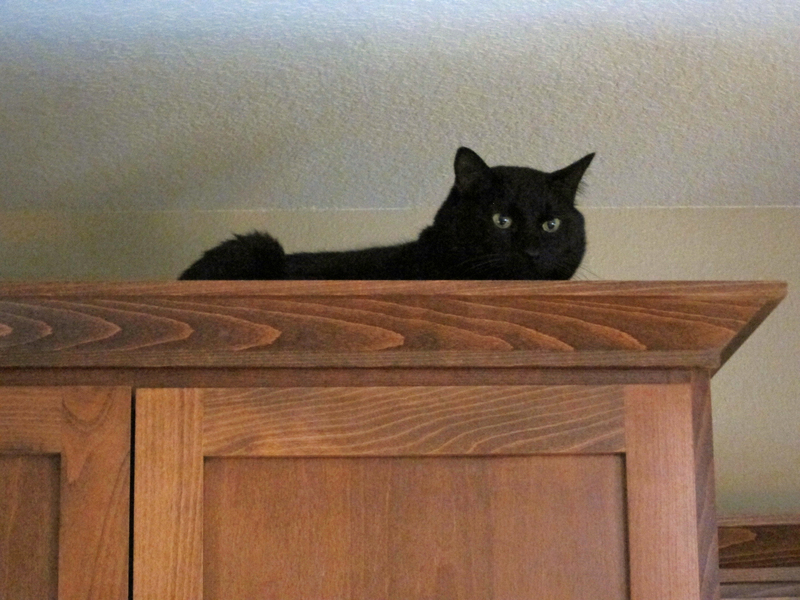 He jumped up to the top of the cabinets over the fridge. I heard him before I saw him. I was upstairs when I heard a resounding thunk from the kitchen (no one said he was graceful). It was all good until he realized that he couldn’t figure out how to get down again. 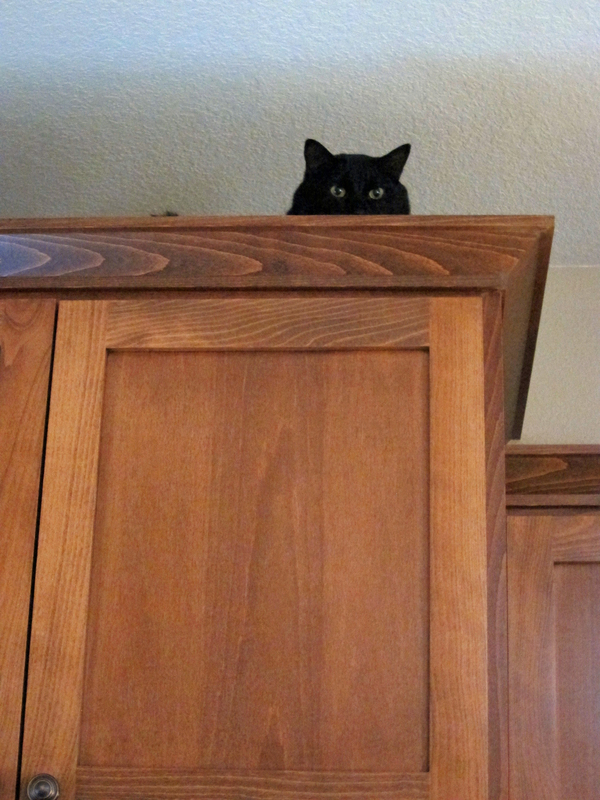 He chortled at me as he walked up and down the cabinets. 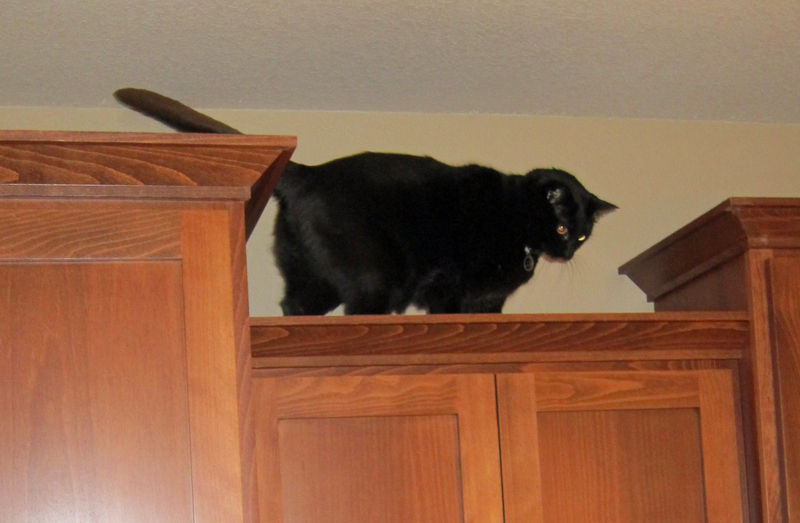 He even looked longingly at the cabinets that he could only reach by jumping far further than I am sure he could jump (and there are snowglobes on that cabinet — the last thing I needed for both of our sakes was for him to try to make that leap). 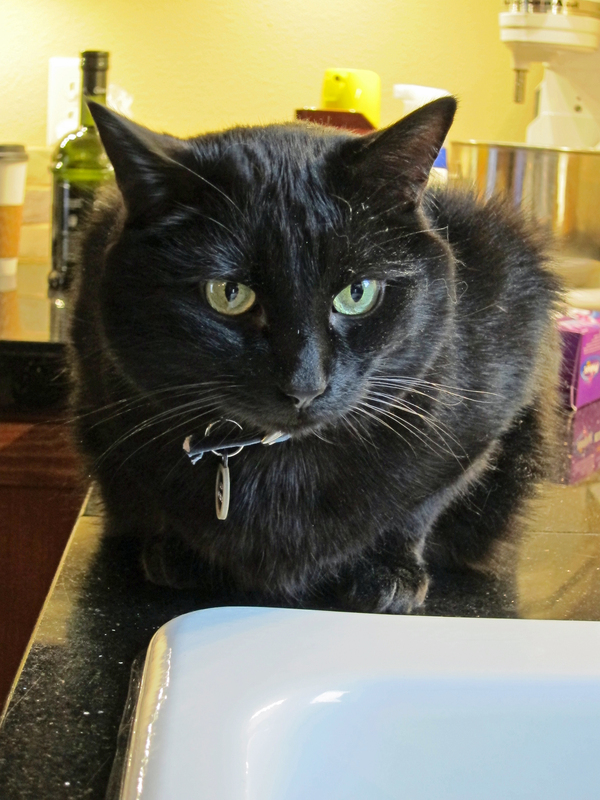 Finally, I climbed up on the counter and pulled down the squirming, chirping, irrational kitty and placed him on the stove. 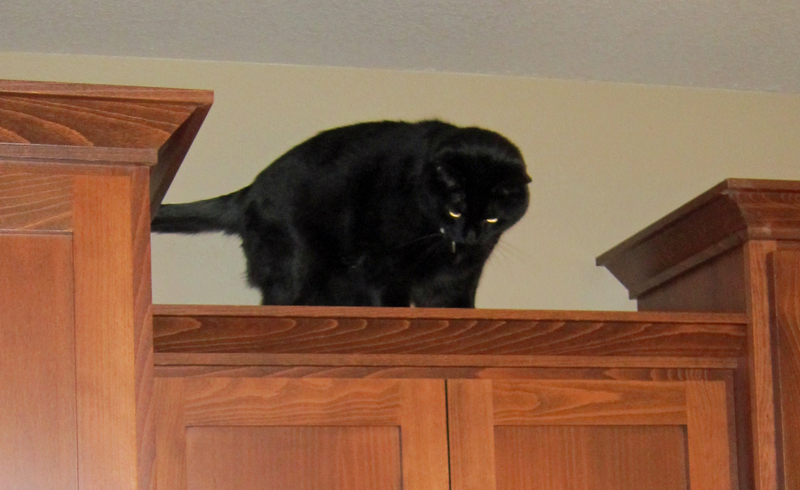 I guess I did get something out of Gus’ little adventure — he was covered in cobwebs and dirt when I pulled him down, so his daring leap clearly managed to clean at least part of the cabinets for me. Did he find his way down? In my experience, they always do! Naughty kitties stirring up our dust! ;). But it is the coolest spot!! Don’cha think? If you were a cat….? LOL … you probably did download the full post. For some reason, wordpress had an issue saving everything, so I had to add in the last two pictures and final part of the story after it posted the first time. You really think he would have made it down? I was hopeful, but he just kept pacing and meowing at me. Yes I do. My cats have done it. They’re scared and then they find they CAN do it, then they go up again. My outdoor one does it from the roof to the upper deck (then gets stuck there until someone lets him in). That is his preferred way. BUT, note to self, I let him in and he had a mouse in his mouth and he went into my bedriom. I THINK my husband took care of it but he never saw the mouse exit the room to the outdoors, just THINKS it did! I want to sleep downstairs with the cats tonight :)! Gotta love them! 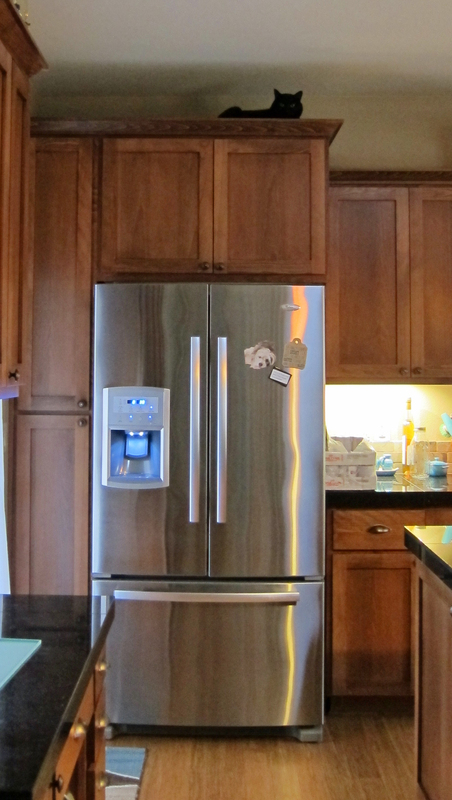 By the way, B-e-a-utiful fridge (drool)! Wait, how are you getting magnets to stick to your SS refridge? Nosy ,eh? LOL … I didn’t know that they generally didn’t stick to a SS fridge. Thanks! I like it, but it the interior is a little small. It’s great for me, but I don’t know how it would be good for families. Well, that sounds good hahha! At least, you saw the positive side of Gus’ silly decision. Awww … thank you! I try to keep these things nice and light and fun to read. My animals are insane and keep me entertained, so I want to pass that fun along to others. And I like that others think they are adorable, too.